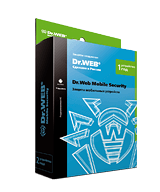 Remotely administer and configure the Dr.Web software installed on local network computers. Remote control does not require the Dr.Web Control Center. A remote connection can be established from any computer to any other computer. Administration capabilities include: retrieving statistics and logs from a remote machine, viewing and changing module settings, and starting and shutting down anti-virus components. You can also register a serial number and replace a key file on a remote computer. To use this feature, a remote connection must be allowed on the target machine.